Somewhere in the midst of Youtube videos, MP3s, digital downloads, Pandora, and Serato Scratch, a unique art form has been lost. It’s not just the gritty, raw sound of vinyl records that I love, but the art of the album cover is a unique medium in its own right. Album art complimented the artistic expression of musicians in an important way that’s not duplicated in today’s music. Before music videos, it was the iconic photography and graphics of album cover art that captured the imagination of listeners (just look at any Blue Note Album Cover from the 60’s and you’ll see what I’m talking about). Call them purists or call them old school, either way people who listen to and collect records are some of the coolest people around. When my husband and I dated we frequently went record shopping together. It is still something we love to do to this day. He produces music as a hobby and our record shopping trips always include finding obscure samples that could be chopped up and repurposed into a new composition. Fat Beats on Melrose is a record store where lovers of hip hop feel at home among the DJs, artists and producers all searching for the perfect beat. Perched on the second floor of a sketchy building amongst tattoo studios and hipster clothing stores, shoppers are enticed into Fat Beats by the thumping bass of the guest DJ spinning in the store. In Fat Beats you have people from all walks of life all sharing a love for hip hop. Signed album covers and posters lined the walls and artists would come in for impromptu performances. It was truly a hip hop paradise. I recently visited their L.A. store and found out that they are closing their doors on the 18th; their NY store closed over Labor Day weekend. I’m really sad over the loss of a legendary hip hop gathering place. I’m much older now and I don’t go to performances or clubs, but a trip to Fat Beats was like stepping into a DJ booth. If you haven’t been to this store, you have a few days to experience the magic, especially if you catch their farewell party on the 18th. Their closing truly marks the end of an era. If you love vinyl as much as I do, I urge you to find a record store and show them some love. Support a dying art form and feed your musical soul at the same time. Highlights from the NYC farewell can be checked out here. Awesome read. I hope I won’t be writing a similiar piece one day on bookstores, but I am afraid I will. R.I.P. 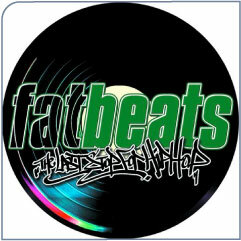 Fat Beats! Keep hope alive Mel! I just came home from Barnes and Noble and picked up a copy of “The Girl with the Dragon Tatoo”! Previous Previous post: Is Trouble Brewing at the Museum of African Diaspora?